The Unbroken campaign has been running now for one full week. During this period I have raised the default and individual keywords bids for both search and display. I have also decided to run a parallel campaign on Microsoft Adcenter. So now searches on Bing are displaying the same ads as those on Google. 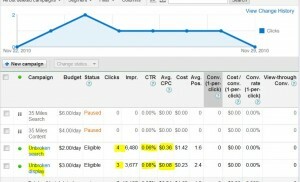 An early Google placement report indicated that my ads were appearing on a few irrelevant sites. These sites were excluded. When I was running a campaign with keywords related to Flight 1549, my ads were appearing on some very high traffic sites like the Los Angeles Times, New York Times book review, CNN, and USA Today. All of these sites have reviews of Laura’s book and they’re all also showing Google ads, but so far I haven’t been able to get my ads to appear on those sites using keyword matching. Here is a review of Unbroken on the New York Times Books page. There are at least two places on the page where they are displaying Google ads. So in order to help Google place my ads on this page and similar pages, I am adding this page and a number of other pages to my managed placements list. The goal is to get the ads to appear on these high traffic sites. I’ll know how successful I am by next week. My past experience was that it took upwards of .75 cents a click or more to get on some of these high traffic sites. But by adding these to my managed placements list, I might be able to squeeze in there for .40 cents or less a click. Nice if you can pull it off. Have an ad on the New York Times Book review for 40 cents. So other than the above, how has the campaign been doing? It’s hard to say this early in the game. It’s also hard to determine how much the holiday season is impacting the numbers. But here’s is a first week summary. So the first week I had a grand total of 6 clicks. The highest I paid for a click was .36 cents. So I’m not losing any money. That’s for sure. In fact, I had over 10,000 impressions of my ad for a grand total of $1.65. A .16% CTR is okay, but I’m shooting for much higher. 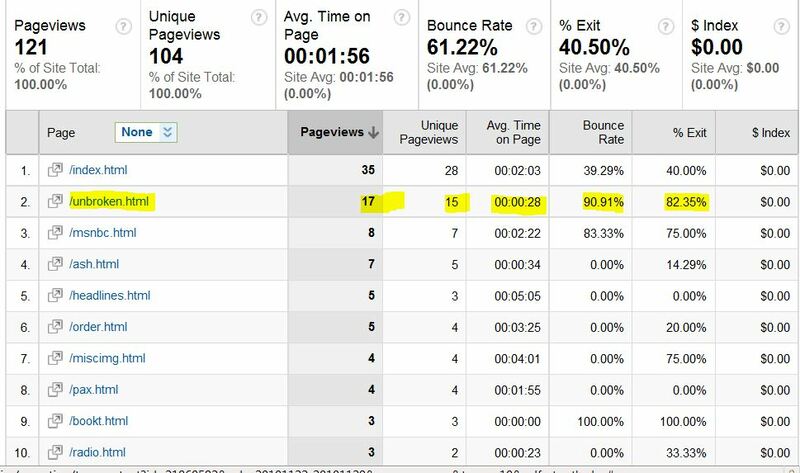 One interesting thing to note here is that there were a total of 17 page views of the Unbroken page. 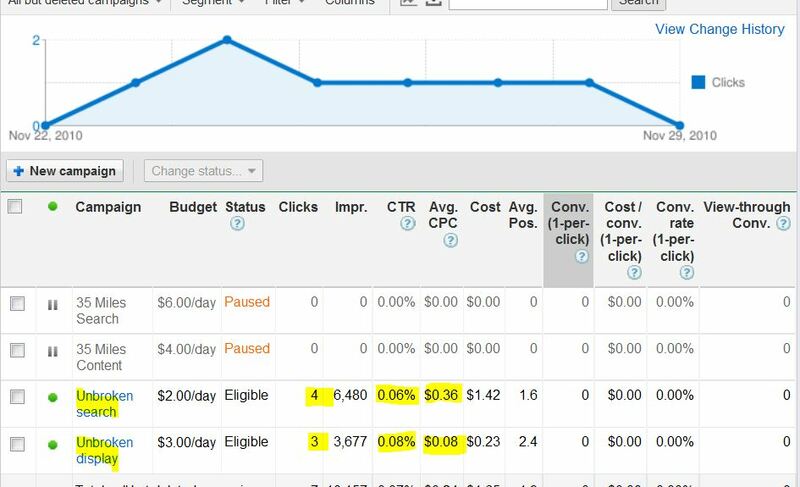 Yet I only had 6 clicks from Adwords. I had a few clicks from the Adcenter campaign but only one or two. 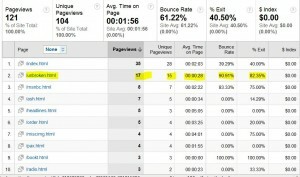 That means that at least 8 to 10 people visited the page by typing the URL directly into the browser. This could be people following along with these blog posts and who were kind enough to not actually click on the ad. If that is you. thank you. But there could also be a number of people who just noted the URL and typed it in. The bounce rate and exit rate is about as expected. 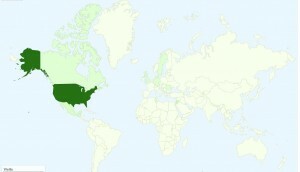 Here is the map overlay that shows where visitors came from. That’s about it for measurable results. There isn’t enough data to make any meaningful comparisons. What about sales? I won’t have that data until the middle of next month. I did have the number one selling aviation title for the Kindle for one day. But I can’t really say that it was related to the Unbroken campaign. So that’s it for this update. Look for another update in a week or so, unless there is some major breakthrough, like getting on the New York Times book review page.